Dakota Star Standard Sham by VHC Brands - P.C. Fallon Co. The Dakota Star Standard Sham measures 21" x 27". The Dakota Star collection is black and khaki, featuring a traditional 8 point star in the center. 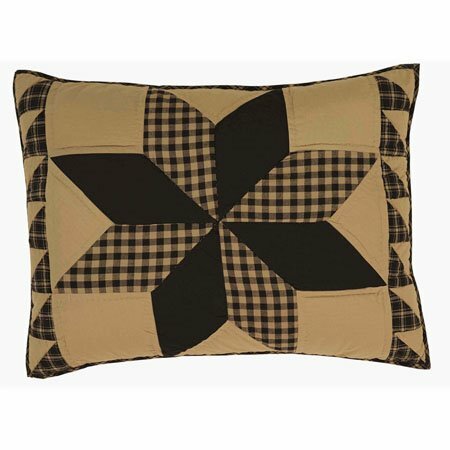 The star is made of checks and solids and is accented at each end in black and khaki plaid triangles. Plaid binding trim. On the back of the sham is a solid khaki fabric and a 3-tie closure and a 3" overlap. This item is imported. Please note, colors may appear differently in different resolutions and on different computers. From The Ashton & Willow Line made by VHC Brands. Manufacturer's UPC code is 840528109195.